Brexit: Why are we more concerned about the rights of EU nationals than those of Britons in Europe? Seriously, this is a joke right? Perhaps it was misreported? European Commission head Jean Claude-Juncker rebuffs olive branch offered by British Prime Minister Theresa May when she gave an assurance to protect the rights of EU citizens living in the UK. And not surprisingly, campaigners claim that May’s offer only served to raise more questions than answers. What about Britons living in the EU? Why are we fighting for EU nationals? I cannot but remain perplexed to this day why there are many, including the House of Lords, who insist on protecting the rights and provide certainty to EU nationals living in the UK, and showing no concern whatsoever about the future of Britons living in Europe. What May did was right when she said that while she would like to provide the certainty demanded for these EU nationals, she had to, as the leader of the United Kingdom, fight for the rights of Britons. Makes sense right? She has adamantly and hopefully will not budge until the rights of Britons are given similar protection in the EU. She is a politician and a leader. A leader who fights with enough ammunition and like it or not, she is using EU nationals living here, as hostage. Is it ethical? No, of course not. But is the EU playing fair? Seriously? Are they? Forget about the EU as a grouping. Has France, Germany, Italy, Spain or Portugal even come out individually to give assurances on the future of Britons living and working in their respective countries? No. Is anyone fighting for them? Are there campaign groups in these countries asking the governments to protect Briton’s rights to continue living there? No. Well not one that I have come across anyway. And yet, there are people in this country who are more concerned about EU nationals than Britons. I urge all to note that Brexit is not as simple as Boris Johnson may want you to think. It is complex, it is going to be painful and the UK government needs to stock its firepower in preparation for the talks. Not doing so will only be foolish and say what you may of her, but May is not a foolish person. Please remember the Brexit talks are about the UK’s future, our future, our children’s future. If May needs to be brutal, well, go ahead, I say. Juncker is not playing nice, so why should we? Have you read the comments made by him and other EU leaders following the Brexit vote? They were nothing short of insulting and it was aimed at the British public – you and I.
I am all for EU nationals living and working here to remain in this country. Why not? They are working. They are contributing to the economy and they bring in the diversity and cultural richness that the United Kingdom is so proud of. and well-known for. There should not be any question about us not welcoming others as long as they contribute to the economy. Refugees fleeing war torn countries are another issue that I will tackle later. What we however do not want is EU nationals with no jobs, sponging off the NHS and claiming benefits. Hey, we have enough home-grown Britons already on a lifetime of dole and an NHS that is ready to collapse. So understandably we just cannot take on anymore economic migrants. Following post-Brexit, local media, including the BBC reported on the uncertainty over the future of EU nationals living and working here, especially the fate of the NHS, which is heavily reliant on foreign workers. I could not help but laugh at how the media were playing to certain pro-EU politicians by harping on a non-story. Do you really think May will kick out EU nationals who are contributing to the economy? At most what could happen is EU nationals may be forced to apply for work visas. As long as you are in a priority sector like the NHS, there should not be any reason why your application should be rejected. And to make it simpler, the NHS could even apply for these visas on behalf of the EU nationals. And rest assured, the Immigration and Border Control is pretty efficient and does process these applications relatively fast. So come on guys, it does not matter whether you are Conservative, Labour, Liberal Democrats or even Ukip supporters, we need to fight for the rights of Britons, whether they are living abroad or in this country. We want foreigners who contribute to our society to continue to remain here. Britain has a history of welcoming people and that is not going to change. What is only going to change is we want people who come into this country, to join us in building the nation, not sucking the life out of it. Who forced 12-year-old Prince Harry to walk behind Princess Diana’s coffin? The Royal Family? Think again. Like most people around the world, I was shocked when Diana, Princess of Wales was killed in a car crash in 1997. What a waste of life! I felt sorry for her two boys who had just lost their mother in the most dramatic and public fashion. Sorry Harry, but today, the same thing would have happened..
Hmmm. … the media does indeed have a very short memory. Why did Harry together with brother Prince William, their father Prince Charles and their grandfather Prince Philip, walk behind Diana’s coffin? Of course, let us not forget Earl Spencer, Diana’s brother, who famously slammed the royal family in his eulogy. Prince Harry was not blaming the royal family. He was blaming the media. He was blaming the public that the royal family worked so hard to serve. Following the aftermath of Diana’s death, the royal family stayed firmly rooted in Balmoral as the media, backed by public outcry, slammed the Queen for her insensitivity in dealing with the death of the very much loved Diana. I never really understood the outcry. I never really understood, why days after her death, the Queen, Prince Charles and the two grieving boys, were forced to disembark from their cars in London, to view the large display of flowers, cards and gifts placed by the public at Buckingham Palace for Diana. When the world’s TV cameras showed the boys, smartly dressed in suits and ties, walking around the sea of flowers, reading the cards and greeting members of the mourning public, my anger grew. The grieving public wanted to see the royal family mourn. They wanted to see the two young boys – Prince Harry was only 12 years old at the time – walk around with a sad face. Why? Seriously, why? I can only assume the Queen and Prince Charles were advised to take the boys and make a public display of them. Pressure was put on them. By whom, take a guess. And I can only assume that there was resistance to do so by the both of them. And rightly so. I lost my father when I was 14 years old. It was a very heart rending and painful thing to go through. The last thing I wanted to do was to go out in the full glare of the public, dressed up and smile. But Prince Harry and Prince William did. They should have been left in Balmoral. They should be in their pyjamas and dressing gowns, privately grieving for their mother with their father, grandmother and grandfather to comfort them. So what if their father is the heir to the throne and their grandmother the Queen of Great Britain. As far as I was concerned, they were just two poor boys who had just lost their mother. They should NOT have been forced to put on fancy clothes and put on a brave front to face the public. Who made them do that? Any counsellor will say that to thrust the two boys so soon in the public eye, to “do their public duty, was nothing short of cruel and heartless. That is what the British media did. That is what the British public wanted. So don’t be surprised if the royal boys are not too thrilled by the media. And let’s not forget how photographers – freelancers or newspaper-employed – harassed their mother right up to her death. Then the focus turned to Harry and William. And sadly now Prince George and Princess Charlotte. Come on guys, leave the boys alone. They have done well in talking about their mother’s death in the hope to help others to open up and talk about their own internal conflicts. But let’s stop blaming anyone for what they went through, least of all their immediate family members. If you are looking for someone to blame, look at yourself. 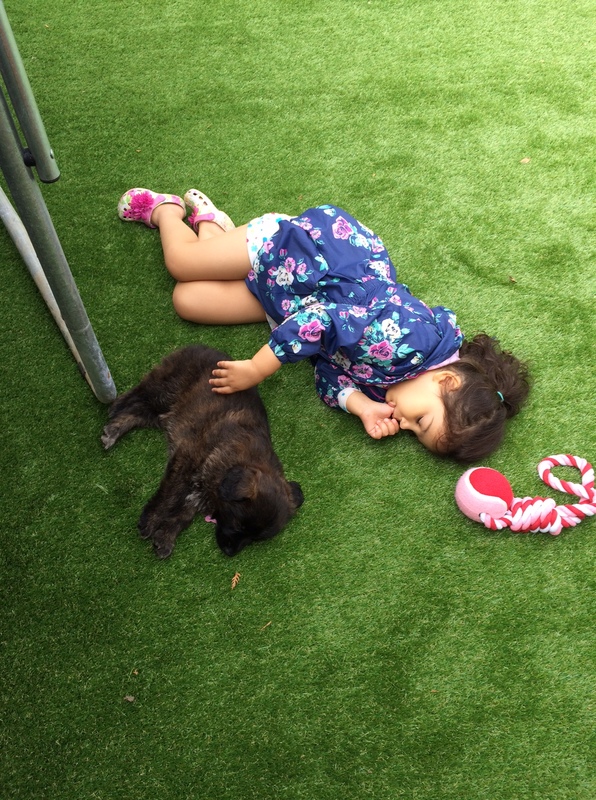 Priya and Sasha … happily tired after playing with one another. I must have been mad. Actually, let’s be honest. I was mad. How could I, a career woman, an adult with brains, agree to take on an 8-week old puppy with a four-year-old daughter at home? Well, mad and STUPID I would say! And don’t forget to take into account a husband who behaves more like a teenager than a father. So, in a rather stupid fashion I gave in to: “I have always wanted to have a dog” whine from the husband. Why you may ask. Well, for one, I am a firm believer that when you really, really, really want something, get it. Of course, it was the husband who wanted the dog. And now, we all pay for the decision – my decision! After 9 months of pain, dog pee, and all the other crap that comes with it, the husband is still very much in love with Sasha – the dog, not the daughter. It is touching to see him cuddle the dog, talk to her, brush her, feed her and even watch TV with her. There is however one big problem. The husband does all these with Sasha … forgetting that the daughter and the wife are actually around! When I gently remind him that he is ‘neglecting’ the daughter, he gives me that look and then walks away. “Of course not, ” comes the curt reply. He claims not to know how to comb the daughter’s hair or even remove a hair-band. But he brushes Sasha for hours. He does not know what food to pack for the daughter but he knows the treats that Sasha loves. It has been a while since I have asked for a kiss from him. Priya and Sasha love playing with one another. I have been keeping a watchful eye on them. More because of the daughter. The poor little dog has no voice, and the only way she reacts is to bite or growl. And my little one thinks growling is ‘play talk’, So she growls and snarls back instead of stepping back in utter fear as most people would do. But the both of them have come to an understanding of sorts. Sasha has come to accept the daughter’s behaviour. And if she does not like it, she runs and hides. And my daughter has learned how to accept Sasha. If Sasha runs and hides, she runs after her and gives her lots and lots of cuddles. It is no wonder that Sasha loves it when it is bedtime for Priya! So what happened this morning? Priya had gymnastics before school and we were all in a huge rush to get out the door. After breakfast, I told her to go to the bathroom to brush her teeth. After cleaning up the breakfast room I entered the downstairs toilet to find the daughter and the dog in the little room …. Needless to say the dog bolted the minute I opened the door. And what was Priya doing? She had a very, very wet … dripping on the floor, wet towel in her hands. My little monkey had wet the towel and was trying to ‘clean up’ Sasha. God … and it is only Tuesday! UK elections: No one has won. Really? The people have won! The results are out. ‘Hung Parliament’ newspaper headlines scream on Friday morning. ‘No one won’, claims political pundits. Oh come on now. No one won? Think again. The people and democracy won. Hands down. I am a bit miffed with comments like these. Lets get some perspective on the issues at stake here. Just because Prime Minister Theresa May failed to win a clear majority, it does not mean that she lost. Her gamble to win strong backing to allow her to proceed with Brexit talks has failed. Nothing else. Technically, the Conservative Party, which May leads, still is the biggest party in Parliament, albeit with less seats. The Labour party has not lost either. True Jeremy Corbyn is not in a position to form the next government but he has won more seats and gained in popular votes. No one can deny that. So who has lost? The UKIP – formerly led by Nigel Farage – is now being viewed as a irrelevant party. After all, the party was formed to get the UK out of Europe. It has achieved its aim. But it has not really re-invented itself in a serious manner to draw voters. What media pundits and political analysts need to take a serious look at – the figures. Brexit and Remain voters and who they voted for. Youngsters rallied behind Corbyn. After all, his socialist policies, were beyond attractive, although how they could be funded, is another issue altogether. And May’s economic policies, are hard hitting and is affecting far too many households fighting to stay afloat. We need to ask ourselves some very pertinent, relevant and perhaps a few hard hitting questions. Why did the Conservatives lose more seats. How did Corbyn, despite media putting him down at every possible opportunity turn around things? Previous media comments that Corbyn would not be able to win elections will now have to be re-thought. Can he win another election? Perhaps. It is no longer a wild idea is it? The reality is, most people believe the Tories are the best party to fight Britain’s corner. And to be honest, I can’t really deny that. But in any democracy, giving one party a free hand to pass through legislation regardless of what the people want is never good. Hopefully, May will not step down like her predecessor David Cameron did when Britons voted for Brexit. I can only hope that she will be man enough to stand up and say The People have spoken. Respect that and get on with the job. Lets hope May is different. We have seen a little of this when the media lambasted her for ‘doing a U-turn’ on her social care policy. Get a grip please. Yes she did a U-turn, but most importantly, she LISTENED to the feedback and changed her policy accordingly. What a shame her campaign manager did not highlight that fact and work it to her advantage. That is the leader we want. A leader who has to make hard decisions but at the same time is capable of listening to the people like you and me and who is not against changing decisions, regardless of what the media may tag her. Also May, please rethink your economic policies. Yes it is going to be hard. Brexit will be hard on everyone. We have been going through hard times since 2009. We have higher employment rates and most households are still having difficulties meeting day-to day-bills. MPs may be oblivious to these problems given that they have given themselves a hefty pay hike. The Independent Parliamentary Standards Authority announced in February 2017 that MPs’ pay will rise by 1.4%, their second hike since the previous General Election called by Cameron two years ago. In 2015, the IPSA raised MPs wages by 10% in 2016 from £67,000 to £74,000 per year. This is a sizeable income, and considered upper middle class wages in the UK. Most families, even with two parents working do not even come close to taking in such earnings. And yet, public sector pay rises have been capped at 1% a year until 2020. Is that fair? Well the lawmakers seem to think so. Well, this is an interesting one. Corbyn needs to get his MPs to toe the line. The party voted him in … not once but twice he was backed strongly. And now the people have spoken. He has delivered credible results. His MPs should rally around him and start becoming a credible opposition party to question things put forward by the Tory government. Labour is not just Corbyn. Labour is an opposition party. And we need a strong opposition party to question Brexit talks, to question economic policies, to question NHS policies, to question social care, welfare benefits. For crying out loud, just be a strong opposition party and stop bickering among yourselves. Stop fighting Corbyn. Work with him. At the moment, he is all you have got and hey, he has the support of the public. After 10 years of marriage, still battling with husband over room temperature! I STILL remember the day I first arrived in London. It was Jan 4, 2003, in a cold, wintry evening. My best friend during the first few months was the radiator, until I discovered the joys of an electric blanket. My life has not really changed that much since I first walked out of the Malaysia Airlines flight. The electric blanket is still a firm and steadfast ally in my battle to remain warm during winter and the cold evenings the rest of the year. When my husband and I married and moved into a flat together in January 2006, little did I realise that keeping warm was going to remain a lifelong battle. Every winter, it is a constant battle to reach an agreement on what is classed as “comfortable temperature” for the both of us. Did I forget to mention that my husband is Scottish and hails from Aberdeen where the weather is generally, cold, cold and freezing cold? Ok, perhaps I am exaggerating a tad bit, but hey, 18°C is not what I would consider a “comfortable room temperature”. “Well, if you are cold, you can put another layer on, but there is only so much I can take off,” is the constant reply I get from him when I whimper and whine about how cold it is in the house. Needless to say, I spend winters, autumns and spring, and some cold summer days, mostly in thick jumpers. And, believe it or not, we have the window slightly open, even during winter nights for as the husband says, “for some fresh air”. Why anyone would want bitingly cold fresh air is beyond me, especially in the early hours of the morning, when temperatures can drop to below freezing level. I am now into my second electric blanket and we are still faithful companions. I do constantly edge the thermostat a little higher when the husband is not looking, but I do have to confess that I am now quite comfortable in one layer of clothing but often a woollen long sleeve jumper. And, surprisingly, our fight to contract the temperature is not just confined to the house. The car is another space that we often share for lengthy periods of time and it has often been another angst of mine. Hubby loves to drive with the hood down, and takes every opportunity to do so, yes, even during cold days. All he needs is to see ONE car with the hood down and he decides that it is okay to have his car hood down, regardless of whether his wife is freezing cold. “I will put the heater on full blast for you,” he says, as the hood whizzes, with poor me scrambling to look for my shawl and jacket, which years of experience having taught me to leave in the back seat for days like these.